I love the farmhouse feel of a rag wreath. 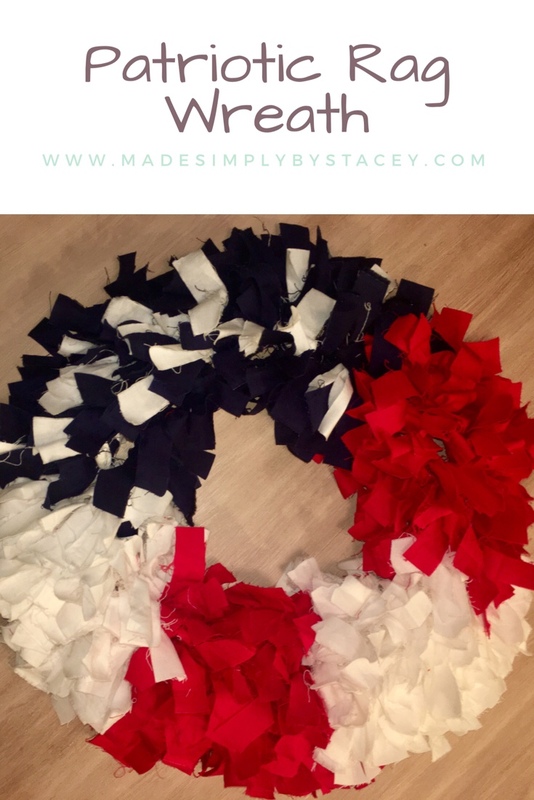 The rag wreath I am making is for the upcoming Memorial Day and 4th of July Holiday. Wreath Form, I usually buy mine at Dollar Tree. Fabric. You can buy fabric or use something old. You’ll need approximately 2-3 yards. The more you use, the fuller it will be. Cut your fabric into strips. Cut them about an inch wide and 9 inches long. They don’t have to be perfect. It is a “rag” wreath. Separate your strips so you can easily grab them as you are tying them to the wreath form. Start your knots from the center and work your way out. You don’t have to do it that way but I find it is easier. Fluff your wreath until you get the desired look. I clip some ends sometimes and pull out the strands that shed from the fabric. Ta-da you have a fabulous rag wreath. Click here to see more fabulous things. I’m going to make one of these for my mothers birthday present love it!